(P1) This news is from Rio de Janeiro. Hundreds of taxis flood the streets, but they’re not going anywhere. They do not move, and they block the streets. The taxi drivers protest against Uber. The taxi drivers say that Uber is taking their jobs. They say it takes 60% of their work. They want Uber banned. 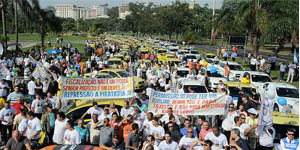 (P2) Tensions in Brazil have been bubbling over between taxi drivers and the app-driven ride-sharing company with complaints of lack of regulation and unfair competition. (P3) One man is a taxi driver for 36 years. Now, he cannot pay his housing bills. Soon, his electricity will be cut off. (P4) This situation is not only in Brazil. Taxi drivers in other countries protest, too. Uber protects people’s right to choose who drives them. Is Uber in your country? If so, do you use their services? In your opinion, should Uber be banned in every city? Why or why not? Which apps do you use? Why? Do you use taxis? Why or why not? I think .the uber really effect inversely to taxi drivers. But their is some benifits of uber to peoples because uber is more safe and professionals than the public taxi.